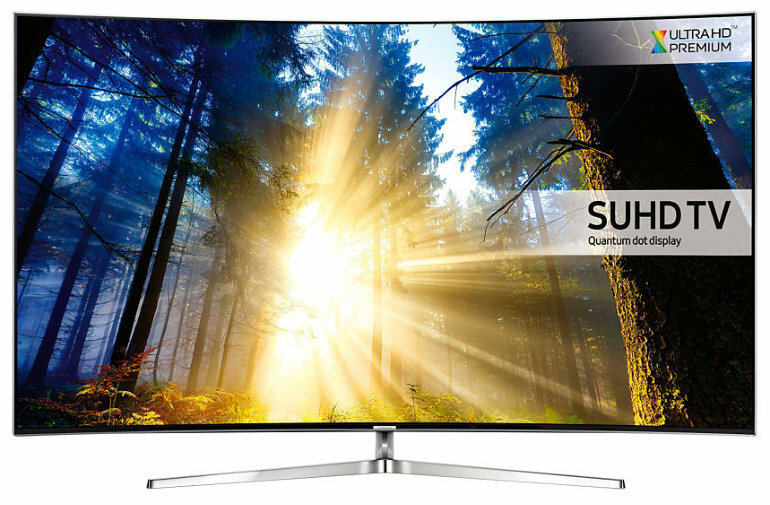 In a nutshell: The Samsung UE55KS9000 is a 55-inch SUHD TV with a stunning slimline design and a curved screen. Picture quality is excellent, with 4K HDR delivering ultra-sharp and detailed images, with accurate colours and plenty of shadow detail, although it's missing out on 3D support. Audio quality is excellent, as is Samsung's Smart TV system, which includes Netflix and Amazon Instant Video, as well as cloud gaming. It's a top all-round TV and highly recommended! 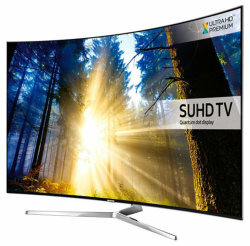 The Samsung KS9000 range sits very nearly at the top of Samsung's 2016 SUHD range of LED TVs, and is available in 49-inch, 55-inch and 65-inch sizes. It's a curved TV, with premium looks to match its price tag. Unlike Panasonic's clunky-looking flagship TVs, Samsung has opted for a minimalist, slimline look that works exceptionally well with large screen sizes. Samsung is calling it a "Bezel-less 360 Design", but this is just marketing spin, as the TV is not "bezel-less" at all. 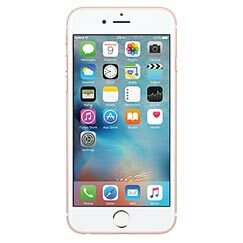 Instead it has a 1cm wide bezel around the screen. The inner half of the bezel is black, and the outer half is silver metal. It's a nice look, despite failing to live up to the claims of Samsung's marketing department. The screen is shockingly thin, thanks to edge-lighting (more of which under Picture Quality below), and is supported by a slender but strong metal Y-stand metal. A subtle illuminated Samsung logo sits discreetly below the screen. 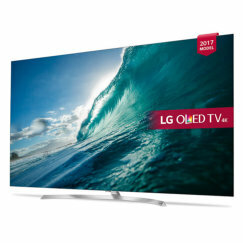 The "360 design" refers to the fact that this TV looks good from all angles, with a textured black back and metal trim, so if you like to look at your TV from behind, then this is the one to choose. Cable management has been well thought through too, with a neat panel to hide unsightly trailing cables. Overall it's a fantastic design, and gets ten out of ten from us here at S21, despite our continued reluctance to fully embrace curved screens. The picture quality of the Samsung UE55KS9000 is truly excellent, and almost breathtaking when first viewed. For years now, Samsung's VA/PSA LED-backlit panels have delivered very impressive results, and this year's SUHD range has built on that legacy very nicely. The 2016 range offers a 15% increase in brightness compared with last year, and a new "moth-eye" technology is used in the KS9000 to reduce reflections. This 4K screen meets the Ultra HD premium standard, and includes High Dynamic Range (HDR). 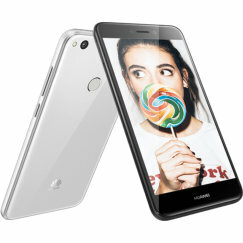 In fact, it has a HDR 1000 rating, which means that it exceeds a peak brightness level of 1,000 nits. At the same time, it's capable of reaching the very darkest blacks ("Ultra Black" according to Samsung), giving it a huge dynamic range. Although this is an edge-lit TV, it incorporates a form of local dimming. While this certainly helps to fill in shadow detail, we found that it's not a match for Sony's new "Slim backlight drive" as showcased in the Sony KD55XD9305. The effect is particularly noticeable when watching films with letterbox black bars above and below the picture. Placed next to the Samsung, the Sony manages a brighter, more colourful picture overall, although the Samsung is still impressive in its own right. The screen is a 10-bit panel, and uses quantum dots, giving it a much broader and more accurate colour spectrum - part of the HDR standard. Motion reproduction is faultless on this screen. The panel is intrinsically fast, and the UHD processing results in an effective motion resolution of 240Hz, which is very fast. Using auto settings, we saw no judder, no flicker, and no "soap opera" effect, making this screen ideal for fast action, sport and movies. If you do find that the auto setting is intrusive, it's possible to override it, but we think the vast majority of people will be very happy with auto. In Game Mode, lag times are extremely low for a UHD TV. We do have a slight issue with the curvature of the screen. At this 55-inch screen size, it's not so much of a problem as with smaller sizes, but unless viewed from directly in front, it detracts rather than enhances the viewing experience. We'd recommend it only if you can arrange your seating to be directly in front of the TV, and not too far away. One area where Samsung screens tend to fall down is in viewing angles. The KS9000 performs better than cheaper Samsung TVs in this regard, but at an angle of 45° there's a noticeable decline in contrast and colour fidelity, and this situation isn't helped by the curvature of the screen. There's no 3D capability on any Samsung TVs this year, so if that's a feature that appeals to you, you'll need to look at the other manufacturers. Samsung has generously assigned a very high PQI (Picture Quality Index) of 2400 to the KS9000, but who knows what this really means? Our rating for picture quality is 4 stars. That's not to say that we're disappointed with picture quality, but that when we compare the KS9000 with flagship models from Sony and Panasonic, there are just one or two areas where the Samsung doesn't quite match the best of the rest. Audio quality is distinctly better on the 55KS9000 than on cheaper models. Despite the slim profile of the screen, Samsung has tucked in a 4.1 speaker system delivering 60W of RMS power. 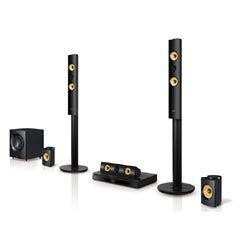 The 4.1 arrangement enables the speakers to capture bass and higher frequencies, as well as the mid-range, adding significant depth and clarity to sound. This pays off when listening to dialogue, as well as enjoying the full punch of an action movie. If you're really serious about enjoying your TV experience, you'll still benefit from hooking this up to a dedicated sound system, and the KS9000 includes Audio Return Channel (ARC) compatibility, as well as an optical audio output. Samsung has updated its Tizen-based Smart TV system again for 2016. The system is easy to use, whether you're browsing the Electronic Programme Guide (EPG), Cath-up TV, or one of the many apps available, including Netflix and Amazon Instant Video. New for 2016, Smart TV includes access to cloud gaming, giving you a console-like experience directly from your TV. The quad-core processor gives a fast response, and there's a choice of two remote controls to use - a standard remote, and a new smart remote with voice recognition enabled. The picture quality menus have been simplified for 2016, hiding many of the more advanced options, on the grounds that most people haven't got a clue how to use them. This makes it easier for most people to choose the option they want, although dedicated AV enthusiasts will need to look a bit harder. The KS9000 includes everything you need to connect to a modern AV network. Wi-Fi and ethernet connectivity is provided, and you can mirror the screen of a compatible smartphone or tablet using the Samsung Smart View app. You'll find 4 HDMI and 3 USB connections, ARC support, Bluetooth connectivity and a digital optical audio output. The TV will automatically detect the type of device you're connecting to, and enable you to control it with the TV's smart remote. A One Connect jack helps to keep all your cables neatly out of sight. The UE55KS9000 is the first Samsung TV for us to review in 2016, and we're very impressed. Samsung has demonstrated with the KS9000 that it really knows how to design televisions, and it's going to be a struggle to find a nicer-looking television than this. 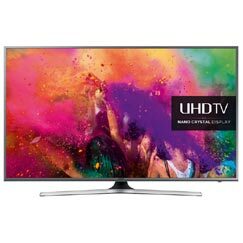 Picture quality is another strong point, with some excellent results from this UHD Premium TV. We're impressed by the high luminance, super-dark blacks, crisp motion, and overall range of the TV, although it doesn't quite match the very best of the competition. We're being picky here, but a TV this expensive has to be perfect to earn 5 stars, and it can't quite match the best on offer from Sony or Panasonic. Audio performance is strong, and the Smart TV system works well and gives a lot of choice when it comes to content and apps. Overall, for a price around £2,000, this premium TV is good value, and highly recommended. There are just one or two things that make it fall short of a 5-star rating from us. The flat-screen KS8000 may well earn a 5-star rating when we come to review it. As this has 2 tuners can you watch 1 channel and record another?